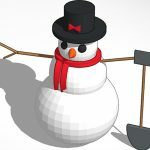 Join us on Maker Monday as we learn the free, web-based 3D Design Program TinkerCAD to design your very own snowman! After class, the snowmen will be 3D Printed and are able to be picked up in a few days. The class (and snowman!) are completely FREE! Participants need to be at least 12 years old (10 and 11 year-olds are welcome with an assisting accompanying adult). Class size is limited and registration begins 30 minutes before class begins at the Tech Desk—first come first serve.